Ergonomic handles for a firm and comfortable grip Heat-treated chrome vanadium steel construction for durability Ideal for home use includes: (5) Slotted: 1/4 x 6, 1/4 x 1 1/2, 3/16 x 4, 5/32 x 4, 1/8 x 2 inch. (3) Phillips: P1 x 3, P2 x 4, P2 x 1 1/2 inch. (3) Square: S0 x 2, S1 x 3, S2 x 4 inch. (4) Star: T5 x 2, T6 x 2, T7 x 2, T8 x 2 inch. (3) Precision: P00, 2.0, 2.5 Ratchet handle (30) 1 inch. Bits Slotted: 1/8, 5/32, 3/16 x 2 pcs, 1/4, 9/32 inch. Phillips: P0 x 2 pcs, P1 x 2 pcs, P2 x 2 pcs, P3 x 2 pcs Square: S0, S1 x 2 pcs, S2 x 2 pcs, S3 Star: T10, T15, T20, T25, T30 Hex: 1/8, 5/32, 3/16, 7/32, 1/4 inch. 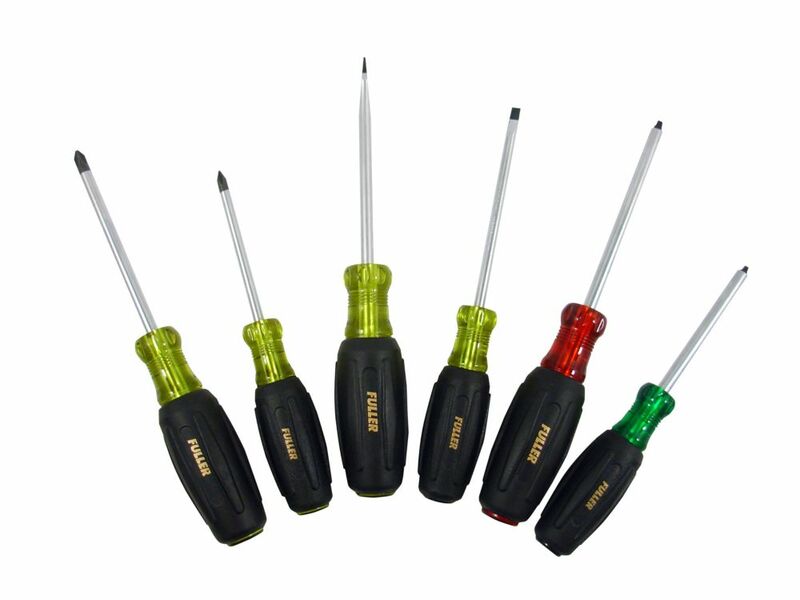 Pro Series Jacketed Screwdriver Set (6-piece) This 6-piece screwdriver set is both industrial strength and professional quality all in one. The soft cushion-grip handle cradles your hand in comfort and helps to prevent blisters, while the chrome-vanadium blade -- solidly anchored in place with flanges -- makes driving or removing stubborn screws a breeze.